sOOp provides the cleans and readies the surface of your skylight in preparation for the application of Liquisol 4Ever or 4EverBlue Solar Reflective Paint. 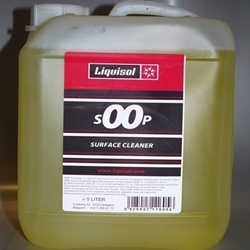 sOOp removes oil, grease and debris which can interfere with the adhesion of the Liquisol paint to the surface, whether it be glass, acrylic or Polycarbonate. As an added benefit, sOOp is an anti-fungal, killing mold, mildew and bacteria. sOOp comes concentrated 10:1 in 5 liter containers. To use simply dilute by mixing with water - 10 parts water to 1 part sOOp, and then use to prepare your surface before applying the Liquisol paint.